What a Great First Week of Crowdfunding! Well that’s one week of my big campaign down and I have to say, I’m absolutely overwhelmed by the positive response I have had from everyone. The campaign is already 30% funded and I am just blown away by all of your support. Thank you so much to all the people who have generously donated so early in the piece and also to all those who have taken the time to share my story with your friends. You’ve really helped me to build momentum and I am so grateful. I have had some great responses to my new Andamooka Opal Microscope range and even had my very first student sign up to one my classes which is so exciting. I can't wait to get the space up and running so that I can begin to share my passion for the handmade with our community. I have had a great response to my newly released Andamooka Opal Microscope range and even had my very first student sign up to one of my classes. Photograph courtesy of Bianca Hoffrichter. For those who haven’t had a chance to take a look at the campaign page yet, I have some pretty darn tempting rewards available to say thank you for your generous donation. In addition to exclusive pre-release entry to my brand new jewellery classes, on offer are a range of lovely Silver Bar Studs, handmade by my dear friend and talented designer, Laurence Coffrant, as well as beautiful handmade Porcelain Paper Cups made by none other than my awesome Mum. To get your hands on these and many more great rewards as well as my eternal appreciation, all you have to do is press the big 'Help Claire' button below and donate to the campaign. My lovely friend Laurence is offering some of her dainty and elegant Silver Bar Studs to reward you for your generous donations. These little guys are great for everyday wear and would make an excellent Christmas present. Photograph courtesy of Laurence Coffrant. Already Donated? Can't afford it right now but still want to help? Please share the campaign with your friends to get the word out there. Cheers everyone! After months of burning the midnight oil, my campaign is ready and only moments ago, I pressed that big blue button to start raising funds for my awesome new jewellery teaching space here at Karma & Crow. The campaign runs until early December and if you have missed my last few posts, I have designed some great new jewellery to say a very big thank you for your generous donations. As part of the big push to get my campaign off to a flying start, I have been working with a very talented videographer, Amanda Davis from Wild Light Projects to create a beautiful introductory video about what I am trying to achieve. The 'Help Claire' button below will send you straight through to the campaign. Please donate whatever you can to help me set up a great space and if you can’t donate, I would love you to share what I am doing with your friends. Your support means so much to me and will help me make our beautiful space here at Karma & Crow even more vibrant. I'm so happy with my campaign video produced by Amanda from Wild Light Projects. More Rewards Announced - Not Long Now! In just a few short weeks I will be launching my crowd funding campaign to raise money to set up a wonderful new jewellery teaching space here at Karma and Crow Studio Collective. We have a fantastically supportive group of talented artists at Karma and Crow and I can’t wait to share our space and handmade skills with the local community. The workshops will be a place where people can come to relax and explore their creativity within a nurturing and social environment. As I mentioned last week, I have been busily working away on some great new jewellery to say a big thank you for your donations to help me get this started. I am just adding the finishing touches to a beautiful new range of Microscope jewellery which feature hand chipped Andamooka opal. Each sterling silver piece will feature a collection of the chips which move freely when worn revealing a variety of luminous opal colours. Magnifying some stunning opal chips from Andamooka, South Australia. 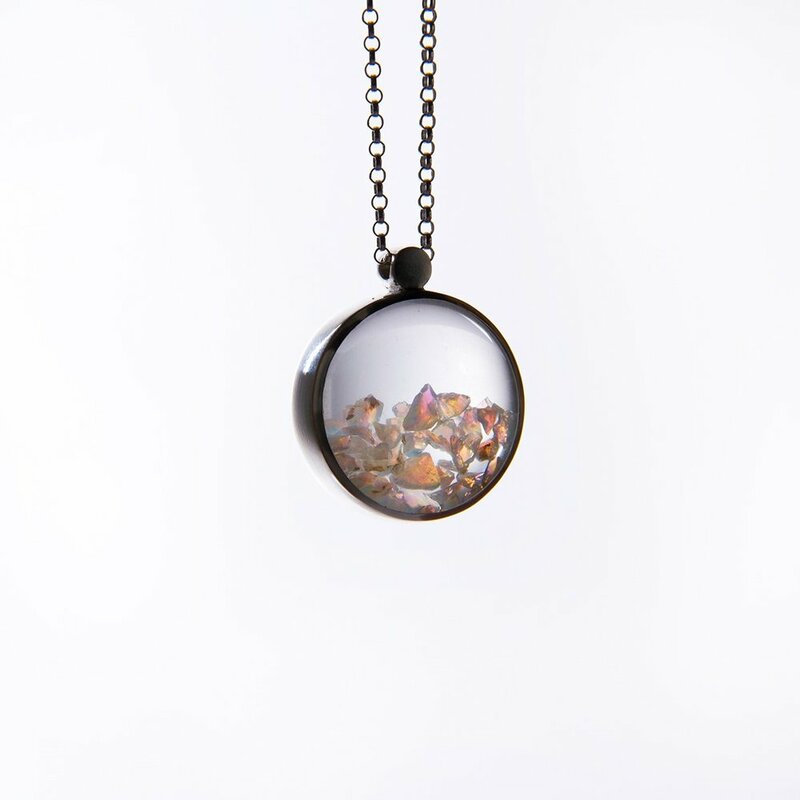 Donate to my crowdfunding campaign to get your hands on one of these beautiful pieces of opal jewellery. I will be releasing a limited number of earrings, studs and pendants as a special treat to say thank you. A sneaky peek at a finished pair of Microscope Opal Earrings. Photograph courtesy of the Talented Bianca Hoffrichter. Setting up this space means so much to me as a maker as well as our family of artists here at Karma and Crow. I would be absolutely thrilled with any donation you have to contribute, no matter how big or small, and even if donating is not an option, a simple campaign share with your friends would be a great help. Stay tuned for more information about the campaign and how you can be rewarded with your very own opal Microscope jewellery. This month I have been busily preparing to raise money for tools for my new jewellery classes here at Karma and Crow Studio Collective. Part of the deal with crowd funding is that I give you beautiful rewards in exchange for your generous donations. Coming up with a list of enticing rewards has been a great excuse to design something different and so today I introduce my new jewellery range, Hundreds and Thousands. Naturally, I always manage to come up with the best ideas when I am in the middle of a huge project and have absolutely no time to work on it. Sure enough, this range of earrings was no different. The idea came to me at least three years ago and as much as I have tried to keep my focus and finish other projects before I jump into the next one, this idea just wouldn't stop nagging me. I started where any good piece of jewellery begins for me – in model form. Following a similar geometric aesthetic to my Interlace adornment, Hundreds and Thousands are hand cut from a single sheet of copper and hung from matching sterling silver hooks. There are nine different shapes in the range and I am offering them in either duck egg blue or rustic blackened copper. Each pair of earrings are hand cut from a single sheet of copper. My new earrings: Only three years in the making! A small happy dance may have taken place when these were finally finished. If you would like to snap up a pair of Hundreds and Thousands just in time for Christmas, keep an eye out for my Crowd Funding Campaign in November. I will be offering these as well as some beautiful new opal jewellery and exclusive pre-release jewellery classes in exchange for your donations. One of our very talented artists at Karma and Crow Studio Collective, painter, Ellie Kammer, has recently launched a Crowdfunding Campaign to explore new work and build on her portfolio to present to galleries for representation. During my time at Karma and Crow studio collective, I have watched Ellie work incredibly hard to establish herself as a contemporary artist and advocate for women with endometriosis: a debilitating disease which she and 176 million other women (1) suffer from. She has had many successes along the way, but in a chronically underfunded field, also needs a leg up to help her pave the way to a sustainable career which is both meaningful, cathartic and thought provoking. Endometriosis (Coagulate), by Ellie Kammer, 2016. Oil on Linen. 200cm x 150cm. Endometriosis (Volatility), by Ellie Kammer, 2017. Oil on Linen, 121cm x 101cm. Endometriosis (Quiscence), by Ellie Kammer, 2017. Oil on Belgian Linen, 198cm x 137cm. The wonderful thing about supporting Ellie’s crowd funding campaign is that you are not only helping an extremely talented young artist to reach her true potential (a reward in itself) but you will also be rewarded with beautiful paintings, prints and other exciting goodies. It’s a win-win situation. Watching Ellie put her reputation on the line with unflinching courage and determination is incredibly inspiring. With the funds from this campaign, she can continue to develop and perfect her fantastic artworks whilst raising awareness about this terrible disease. Head on over to Ellie’s Crowd funding campaign to read all about why she does what she does and you too can make a contribution to help this talented lady inspire more people with her work. Like what you read? Sign up with your email address to receive more news and updates. When I first designed my range, Interlace Adornment, I wanted to create an edgy, paired back version of my Plastic Soup exhibition work while continuing to develop my focus on sustainability. Leaving the microplastics aside, the recycled silver collection challenges traditional ideas of jewellery while also being very wearable. I maintained the same asymmetrical, geometric aesthetic and still hand make each piece with no set composition, ensuring that very little metal goes to waste. No two pieces are exactly alike meaning that when you purchase a pair of Interlace Studs they are very much your own. To make a pair of Interlace studs, I begin by straightening my 2mm recycled silver wire which I then sand and cut into a variety of lengths. I always cut more pieces than I need to give me many options choose from when it comes to constructing the perfect shape. Nothing hinders my ability to create a masterpiece more than running out of sticks. I begin the process by preparing a collection of tiny silver sticks. After the lengths of silver are cut, I use a special tool, called a mitering jig, to hold them in place and file each end flat. I remove any excess metal and add them to the pile. I then give the sticks a refined, geometric look by filing each end perfectly flat. Once I have a good collection of silver sticks in different lengths, I move over to my soldering bench where the creative part of the process begins. I place the sticks together and the intersecting pairs are fluxed and soldered. I then progressively add more lengths of interlacing silver, positioning them at different angles all the while trying to create balance within each tiny composition. When soldering the lengths of silver, I have to be really careful not to overheat the piece as too much heat usually results in the surface tension of the melted solder pulling all the sticks together into an unsightly clump which means I have to start the piece again. The stud shapes are now complete and I choose a surface to attach the post onto, carefully attach it using a solder, then construction is complete. A much faster version of the soldering process. This is my favourite part as I get to be creative while playing with fire. After a good long soak in a mild citric acid solution to remove any remaining flux and oxide from soldering, the studs are ready to be cleaned and polished. I meticulously study each one, filing off excess solder and removing all imperfections. They are sanded to remove all file marks and then placed in a tumbler to give the silver a beautiful homogeneous, matte finish. The final and most labour intensive part of the process is filing and sanding the studs. Though it is a long process, I use the opportunity to catch up on Netflix and podcasts. That's my kind of multitasking! From there I look at all of the studs and select pairs from the group. Each individual earring I make is unique but I try to pair them to complement each other aesthetically. Depending on the piece, I either choose to oxidise the finished earrings, giving them a semi-permanent rich, black surface coating, or leave them with a brushed silver finish. I can never decide which finish I prefer and so I have pinched a pair of each! Interlace Studs ready to go. No two pairs are exactly alike. You can purchase your very own pair of recycled silver Interlace Studs through my Online Shop. They are most certainly made with love. As you might have been able to tell, this month I am pretty darn excited! The reason being that, in February next year, I will be starting up jewellery classes from my lovely workshop, Karma & Crow Studio Collective, here in South Australia. The cafe and studio already have such a fantastic community feel which is a great environment to work in and given my teaching background, I really want to give back to our community by sharing my skills and experience. The joy and satisfaction I find in making jewellery just has to be shared with others. My tool collection for workshops is slowly growing but I need your help to raise funds for more. 1. Keep an eye out for my Crowd Funding Campaign where I will be offering a whole range of my handmade jewellery as well as exclusive classes as a big thank you for your donation. The campaign will coincide perfectly with your Christmas shopping so you can pick up a beautiful present for someone special (or yourself) while supporting a local creative (that's me). 2. If you are a jeweller or hobbyist, you can donate your old (preferably functioning) jewellery tools that you no longer need. I will organise to have them collected, all you need to do is send me a quick email with a photograph of the tools you are willing to donate and your details. Just add tools and our workshop area will be ready for classes. Photograph courtesy of Bianca Hoffrichter. Stay tuned for more information about my crowd funding campaign. With your help we can make this happen! After over a year between visits I recently made the trip home to Western Australia for my childhood friend’s wedding as well as my grandmother’s 80th Birthday. I love living in Adelaide and am truly grateful for all the opportunities it has to offer as well as the fantastic friends I have made but gee it’s nice to go home sometimes! It’s great to catch up with everyone and spend time in the place where my love affair with beach combing began. I feel so connected to the environment in WA and when I am home, I always make an effort to travel down to my favourite beaches to take the dog (and usually some unsuspecting friend or relative) for a walk to comb the shore line for plastic gems. Collecting micro plastic for my exhibition pieces always leaves me with contradicting emotions. On the one hand, the process of searching through the sand in front of the beautiful ocean is peaceful and meditative. It is like a never ending treasure hunt where there is always something new to discover and I am absolutely elated when I find my next precious plastic jewel. I love the way the ocean wears the pieces of plastic beyond recognition, leaving only a trace of the original item. On the other hand, I am horrified that these tiny fragments of plastic are being ingested by beautiful sea creatures and destroying the ocean with toxic chemicals as they break down. A handful of toxic treasures. I have a love/hate relationship with the beautifully weathered microplastics I collect along the shoreline. My home town is Fremantle and given our close proximity to the busy port, I never have to search too far to find a whole bunch of junk washed up on the beach. In my local area, the best beach for plastics is Port Beach, just north of the Swan River mouth. Around this time of year, seaweed lines the shores and invariably, under ever single clump, lies a trove of deadly treasure. Port Beach, just north of Fremantle, Western Australia, just after sunset. It is a beautiful, quiet beach which is constantly choked by discarded plastics. When I collect, I first scour the surface as I walk, removing the larger items that I see. It is not often that I keep this part of the collection as it mainly consists of discarded water bottles, take away cups, lost sunglasses and thongs (flip flops for those in the UK), or used dog poo bags. Yuck! I collect it all up, discard the dog poo bags and take the rest with me to sort and recycle at home rather than using the beach bins which go straight to landfill. From there I get down onto the sand, inevitably doing several hundred squats and lunges, lifting each mound of seaweed to reveal tiny fragments of plastic as I go. I scour through the seaweed, pray to the gods that a dog hasn’t marked its territory on each mound, then collect my precious bounty. Port Beach in North Fremantle, Western Australia, is regretably one of the best beaches to collect microplastics that I have found so far. Each clump of seaweed hides an abundance of deadly plastic jewels. After many hours spent gathering plastics and removing whatever nasty rubbish I can, I go home to clean and sort the collection. I remove and recycle the large pieces I don’t need, then wash the plastic fragments using water and a sieve. I dry the fragments and sort them into different containers depending on size. The large pieces which are interesting enough to avoid the recycling bin are kept aside. I often like the look of these bits as they are more recognisable than their smaller plastic friends, however, have yet to release a range large enough to accommodate them, so into the studio hoard they go. Small plastics range from around 5mm – 15mm and are kept for my Plastic Soup Sculptures. Microplastics, which range from 0.1mm to 5mm and are the most time consuming to find and most deadly to marine creatures as they are often mistaken for a tasty treat. These tiny specks are sorted into colour and reserved for Plastic Soup jewellery. A handful of microplastics found at Port Beach, North Fremantle. Each piece is unique, deceptively beautiful and the perfect size for my Plastic Soup Adornment. My Plastic Soup Sculptures and Adornment house only a minute proportion of the devastating quantities of plastic choking our oceans and shorelines. Given the drastic consequences our waste has on these fragile ecosystems, it seems crazy that we aren’t doing more. It’s easy to feel overwhelmed by the thought of tackling the world’s plastic issues but if everyone did their bit by rejecting single use plastic, using a bin and removing just a few pieces of rubbish when they went to the beach we could really start to make some improvements. A close up of one of my Plastic Soup brooches containing a tiny portion of the microplastics I found while beachcombing around the Western and South Australian coastline. Photograph courtesy of Bianca Hoffrichter. For more information on how you can make a difference, visit the fabulous crew at Take 3 on their website or @take3forthesea on Instagram. Originating in Sydney, Australia, Take 3 have started a wonderful community of likeminded beach combers from around the world who are doing their bit for our oceans and documenting it along the way. It’s not long now before our exhibition, Solastalgia, opens over at the Murray Bridge Regional Gallery and we would love for you to join us. Running until the 15th of October, 2017, the show will be opened by Leah Grace on Sunday the 3rd of September and features a range of very different responses to the pertinent issue of climate change. You can read all about the tour on my news feed and we hope to see you there. Earlier this year I had the pleasure of being contacted by a brand new gallery in the Blue Mountains, New South Wales. 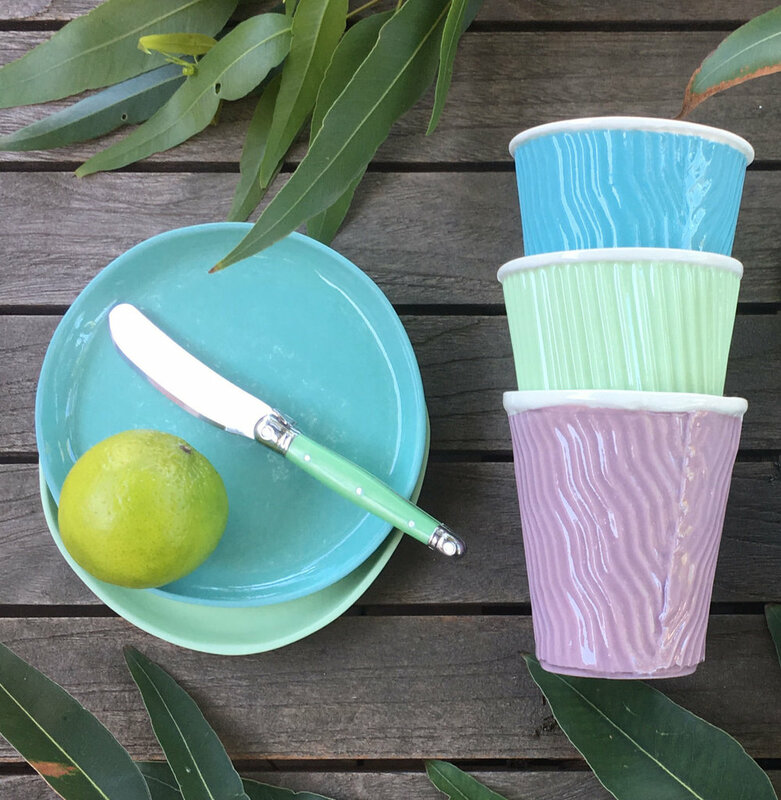 Founded by partners in crime, Kelly and JL, Platform Gallery offers beautifully crafted wares from Australian makers to a region which has previously been overrun by more traditional art forms such as painting. With a background in writing and a passion for the handmade, the pair have formed a deep understanding of both the maker and consumer. Given this enthusiasm and understanding, when they asked me to join the highly curated group of contemporary jewellers they support, I naturally jumped at the opportunity. Platform Gallery on their very first opening night. Photograph courtesy of Georgia Blackie. Gallery owners Kelly and JL. Photograph courtesy of Ona Janzen. Nestled in the heart of Katoomba, the gallery now includes a display of my Interlace Adornment which looks great together with their art deco styled branding and clean aesthetic. As well as stocking a number of local and interstate makers, the space will be hosting a number of regular exhibitions and has also begun a series of exciting new residencies. Interlace Adornment goodies are available in store and online through Platform Gallery. Photograph courtesy of Perth Product Photography. A beautiful display of my work. Thanks guys! Photograph courtesy of Platform Gallery. Platform gallery is a space which is truly invested in their creatives and definitely worth a visit if you are visiting the Blue Mountains.